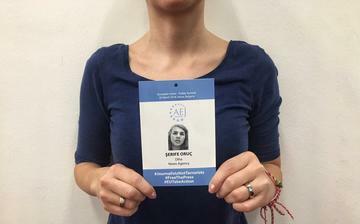 The Association of European Journalists - Bulgaria (AEJ-Bulgaria) issued symbolic accreditation badges for the EU-Turkey Leader’s Meeting in Varna, Bulgaria, set for March 26 for 95 Turkish journalists. The importance of the informal summit, where Turkish President Recep Tayyip Erdogan is expected to meet the Presidents of the Council and the Commission Donald Tusk and Jean-Claude Juncker and the Prime Minister of Bulgaria, Boyko Borissov, is significant. Unfortunately, these 95 Turkish colleagues will not be able to attend the meeting and to do their job to ask questions and to hold the politicians accountable for their commitments, because they have been put behind bars. For that reason, we invite the Bulgarian and international journalists who will cover the meeting in Varna to take a symbolic badge with the name and picture of a Turkish colleague and to speak on their behalf. Our message to politicians is clear: journalists are not terrorists and cannot be treated as such for their work. Even if you put critical journalists in jail, you will not stop hearing them - others will raise their voices. We will speak with their voice. Highlighting this is the purpose of our unusual action as 95 accreditation cards arranged on a table look a lot. But can you imagine that behind each one badge stands a person, and behind them is their family, their friends, their readers, their viewers, their listeners? In the end, we all stand behind this person, as the mission of a true journalist is to serve the whole society. When so many journalists are deprived of their liberty, we should remember Martin Luther King Jr.’s famous quote: "No one is free until we are all free”. Following the unsuccessful coup attempt in the summer of 2016, Turkey has become the largest prison for journalists in the world. Hundreds of media professionals have been detained or prosecuted, while many media outlets have been closed by the authorities. Even now a huge number of journalists are still behind bars. How many exactly? The numbers vary. According to the list of the Stockholm Center for Freedom, 190 are currently jailed pending trial and other 55 are already convicted, some of them for life. According to the Platform for Solidarity with Detained Journalists - they are 212. The Union of Turkish Journalists mentions 145 names, and the Association of Progressive Journalists - 135. In any case, the number is shocking. We rely on the solidarity of both Bulgarian and European colleagues. Let's talk with one voice - the voice of freedom of expression.